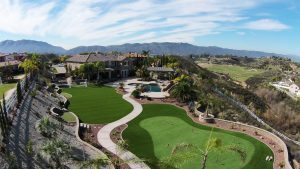 Celebrity Greens of Southern California is your authorized dealer and installer of premium artificial grass products throughout Southern CA. Let our professional team of landscape experts help you design you waterless grass solution. 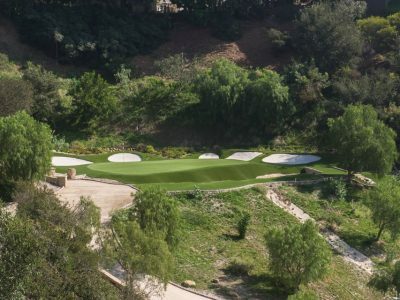 Celebrity Greens San Diego is experienced in projects ranging from residential landscaping, playgrounds, commercial applications, amazing synthetic grass installations to signature putting greens. 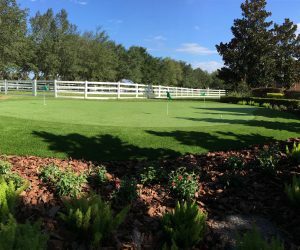 Our customers have peace of mind, a beautiful yard or putting green and we provide them with a manufacturer 8-year synthetic turf warranty. Our synthetic turf comes with tremendous environmental benefits including being lead-free, requiring absolutely no mowing or fertilizing with harmful chemicals ever. Of particular benefit during our drought conditions in Southern California, is the fact that synthetic grass requires no watering or other use of natural resources, other than the occasional spraying down the area to wash off pet waste. Our grass landscapes will save the average home owners thousands in water and maintenance each year, let alone having a beautiful green lawn that always looks perfectly manicured. Our design team’s expertise lies in creating PGA-caliber putting greens. Our artificial putting greens are second to none, incorporating undulations, water features, sand and grass bunkers, challenging chipping areas… whatever you can imagine, our designers and installers can build. Our spectacular putting green designers and installation team will deliver a world class putting green designed to enhance the beauty of your landscape and to improve your short game. 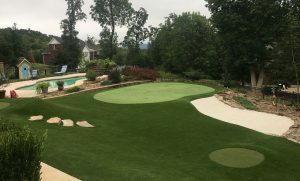 If you’re thinking of a landscape project that involves artificial grass, or you’d like to discuss installing a world-class putting green in your backyard, you’ll want the best quality turf installed by the most capable, highly trained team of designers and installers, then you have come to the right place. Celebrity Greens San Diego offers complete landscaping services, and we are proud to offer products that require very low-maintenance while remaining lush and green through every season and all weather conditions. Call us today to schedule a Free on-site estimate.